2018 Christmas Outfits for Guys. 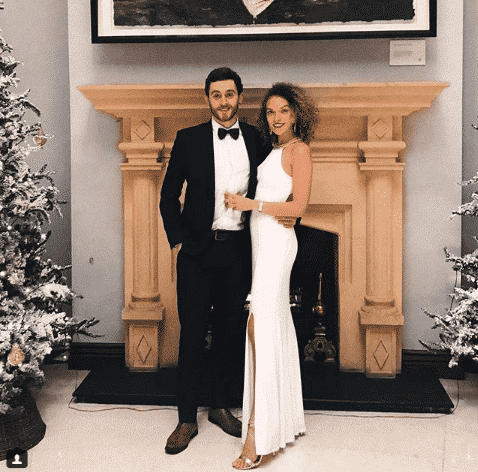 For all the guys who seem to come off the edge when it comes to shopping for Christmas, and they simply cannot figure out what goes best on a Christmas eve and whether formal or informal is the right option to go for. If this sounds even a bit like you, we have got you covered. Above all, it really does not matter whether you dress formally or informally on Christmas, it all depends on your taste and what you feel comfortable in. 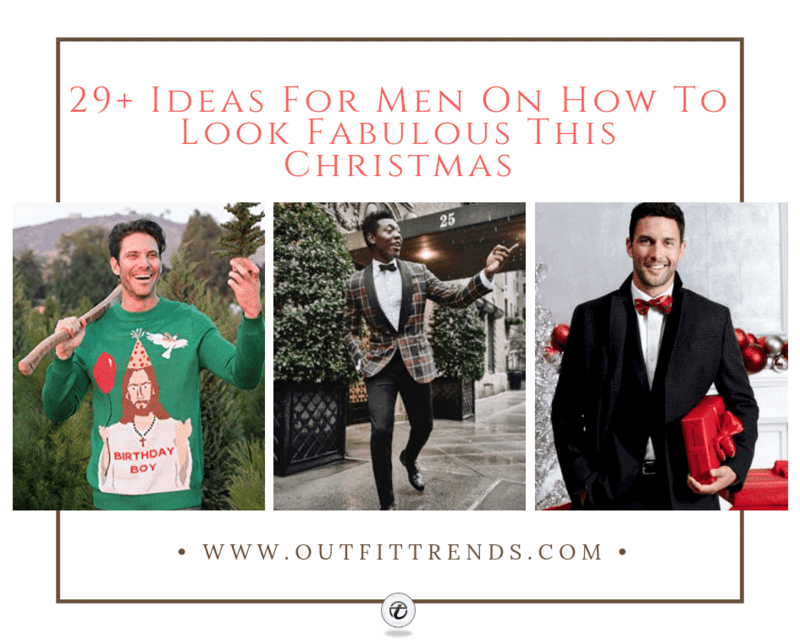 So have a glance at these Christmas outfits for men for the year 2018, that shall cater to men of all tastes, whether they cherish formality or a bit more of a costume style. Don’t miss out on your comfort dressing this Christmas, throw a glance right away! We also recommend you to check out these Men’s Outfits For New Year’s Eve. The formal Christmas dinner attire for guys is pretty simple and straightforward. This is the time to glam things up in your sexiest suit. To take things up a notch, go for a glittery red Christmas bow-tie instead of the plain old black one. If your Christmas starts with a lunch at the pub with your guys then you don’t need something dressy, a casual outfit will work but for the Christmas feel, you can at least add a nice scarf. You should also have a look at these Guys Outfits with Scarves. If you don’t plan on leaving the house on Christmas then it doesn’t make sense to get all dressed up, but this doesn’t mean that you can’t enjoy the Christmas spirit. We suggest that you go for a nice new t-shirt with tailored (but comfy) plaid trousers and a nice warm sweater or cardigan. This is the kind of outfit that would work even if someone comes over for a visit but if you don’t want a casual outfit and just want to go for the PJs then we once again, highly recommend plaid pajamas. The winter coat of the year award definitely goes to the ‘pea coat’. The pea coat is currently being worn by everyone, be it a celebrity or a male fashion blogger and if you want to survive this Winter in style then you too need to get your hands on one. The peacoat is usually worn with pinroll jeans but for a more formal look (that you would usually expect on Christmas), you can easily pair this coat with courduroy pants. While the classic style of pea coats is the safest bet, these days, you can find many interesting or shoutier new styles that seem worth trying, for example, this blue pea-coat that comes with a shearling trim. Blogger Oliver Cheshire has paired this artistic pea coat very smartly with a denim jacket and white jeans. The basic black roll neck has been worn as the inner-most layer and this is always a smart choice as it gives you a good base for coming up with a decent outfit. Nothing makes a funkier Christmas outfit than Christmas jumpers. If you agree with us on that, then here are some really awesome and funky Christmas jumpers that you can go for. Many of us are inclined towards wearing green for the Christmas season but get confused with the right color combinations to wear with it. If you’ve prepared a green layering item like a jacket or sweater then try wearing it with a blue outfit because blue-green is always the best combination to go for and it suits guys of all ages. Here we see a green nylon jacket, paired with navy blue pants, a blue knitted sweater, and beautiful brown chukka boots. If you’re interested in these boots, you can get them here for $315. If you have a formal evening planned this Christmas, or perhaps a cocktail party then we highly recommend this dapper outfit. Go for a classic tuxedo suit in a neutral color like blue or grey. For the bow-tie go for a color that’s a shade lighter than your suit. And if you want to add some pop of color, you could go for a red or green pocket square since you know that these are the most beloved Christmas colors every year. Even though we’re dressing formally, a Christmas party means there will be lots of mingling and moving about so you must be prepared with the most comfortable shoes that you own. Slip-on loafers are a good option here as they keep your feet both warm and comfortable. Who says that all Christmas jumpers need to look ugly, give your holiday sweater a preppy look by styling them the right way. We love this outfit that has been created with a Tommy Hilfiger jumper and matching blue pants with the perfect choice of brown shoes. Try matching the beanie with some element in your outfit. For instance, in this case, it has been matched with the jacket and this helps give the whole outfit a well-coordinated look. Don’t go for beanies with brims as they are extremely difficult to pull off. If you plan on taking off the beanie later on then you need to avoid hat hair. This can be done by only wearing the beanie once your hair is dry, styling your hair before wearing it, using a good hairspray or the simple salt-spray, going for a well-fitted beanie and avoiding poor quality beanies that cause too much static. For men who love to experiment with different colors when it comes to wearing the coolest pants. So gear up your style by wearing the coolest red pants outfit in town! If you like this style, here are 30 Ways for Guys to Wear Red Pants. Jeans are something that most of us are most comfortable with wearing. It is what many of us wear on a daily basis and if you seem to believe that it is your signature look then you should go for a classic jeans style for men for Christmas and just nail it. You could try layering with different combinations for instance a brown leather jacket goes really well with the typical red Christmas sweaters. For the guys who can’t help feeling overwhelmed by the Christmas day and the delicious dinner, a nice velvet suit will do the job of showing just how jovial you are! Pick a maroon or red colored one to match the delightful Christmas theme. You also need to see these amazing Men Velvet Blazer Outfits & Best Ideas on How to Wear Velvet Blazer. So all that you have planned for Christmas is a nice lovely dinner with your peers, and in that case, a nice swag style made out of jeans and jacket would do. It would be best if you can accessorize this outfit well fitted blazer and boots. Match it with a nice muffler too if the cold is getting the best of you! Below is a perfect example for you to dress smartly on Christmas and never lose your swag. Match your classy pair of loafers or other trendy but sporty shoes. Wearing sneakers with formal dressing is also a huge trend, so don’t hesitate in going for that! Winters, as we all know is a great time to dress in the most sophisticated manner possible. So Christmas too is a great platform to take out your classy winter wardrobe and experiment with all the different pieces lying in your wardrobe. Below is a classy outfit with sweater coat and printed shirt for all guys. Here are some of the best Men’s Winter Outfits Combinations for Office/Work. What can possibly be more comforting than your ideal winter style with jacket and boots? Here’s how you should dress for a wintery Christmas and look most confident and classy. For guys who wish to step a bit off the edge and stand out from the rest. Wearing costumes at Christmas is always a good idea if you are planning to make your celebration a big one rather than just a Christmas dinner. Have a look at this eccentric vintage outfit for guys. Check-patterned shirt outfit for guys who are above 30 is highly recommended, as check patterned shirts are usually preferred by adult men. So you can create an attractive outfit out of a cool patterned shirt with pants and a matching pair of sportive shoes because sportive and formal are just meant for each other. For the most typical party outfit for Christmas to wear. Have a look at this stunner of a brown-grey coat with a magenta red top and jeans to create the most theme oriented look of Christmas for guys to rock at. Here are 30 Best Charcoal Grey Suits with Black Shoes For Men. If formal is what you are meant to dress, then this is for you. Just pluck up the guts to wear formal at Christmas as long as you feel your best. Take a look at this semi-formal style outfit for men with a checkered coat and maroon pants and a formal pair of shoes to go with. Some bit of tips for boys as well if they would like to dress casually formal on Christmas. Have a look at this one below that shows a perfect combo of a formal casual style for boys, for both Christmas and street style. Some swaggy outfits to try at Christmas. You can create any swaggy look and match it with a nice pair of specs, stylish shoes, a nice and sophisticated shirt and you are done! Outfit with a waistcoat, hat and a unique pair of shoes will give you a happy vintage style on the Christmas day. The sexiest style of the age — a sensual all-black outfit for men in 2017 to create a lasting impact on the ladies. Not entirely meant for Christmas gathering but it will serve as a good party outfit and will give you the extra bit of glamor you need.